A feathery design pulls the colors of teal, scarlet and yellow across this scarf to create a dramatic statement around your collar, transforming any outfit. 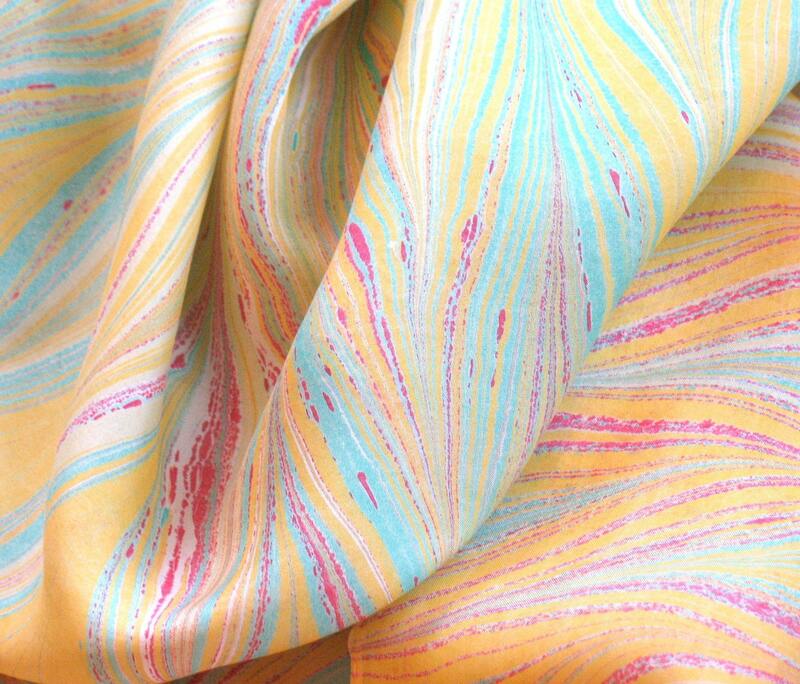 Welcome, and thank you for visiting Brooklyn Marbling to view my one-of-a-kind hand marbled silk scarves. 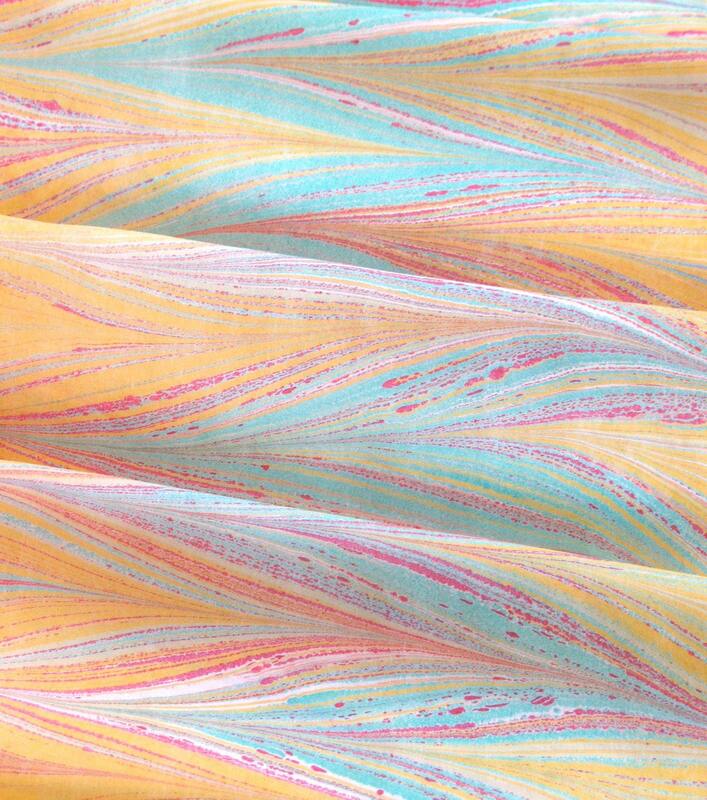 To create these unique scarves I use traditional marbling techniques with a contemporary twist. The improvisational nature of the process insures that each pattern is created only once producing an original piece of wearable art. Be sure to check all the views that are available to see the entire length of the scarf. Only then will you appreciate the variety of pattern and especially the color variations that make this piece exceptional. 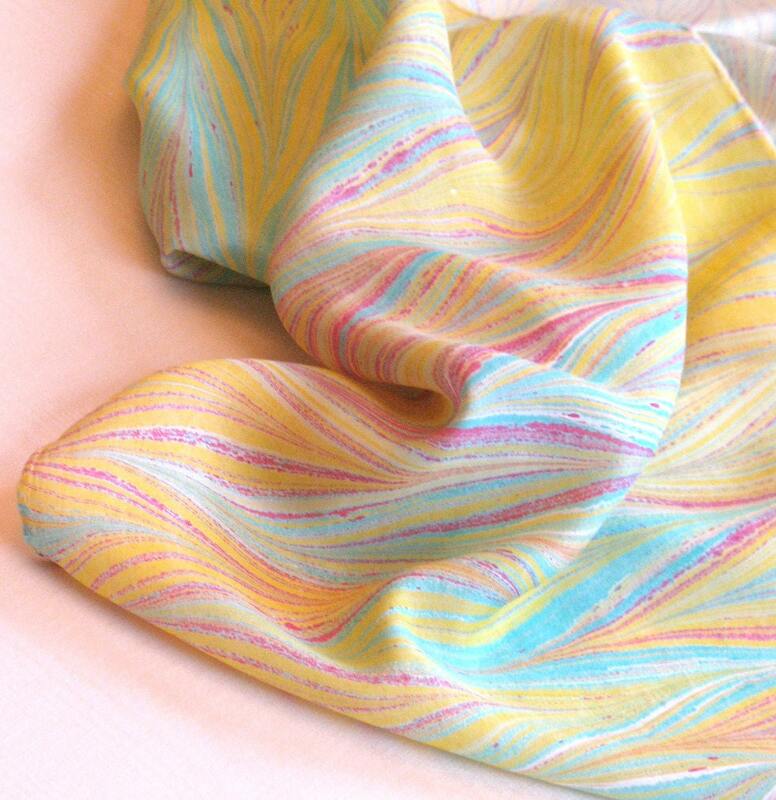 These lightweight free flowing scarves will add unique sophistication to any person style. 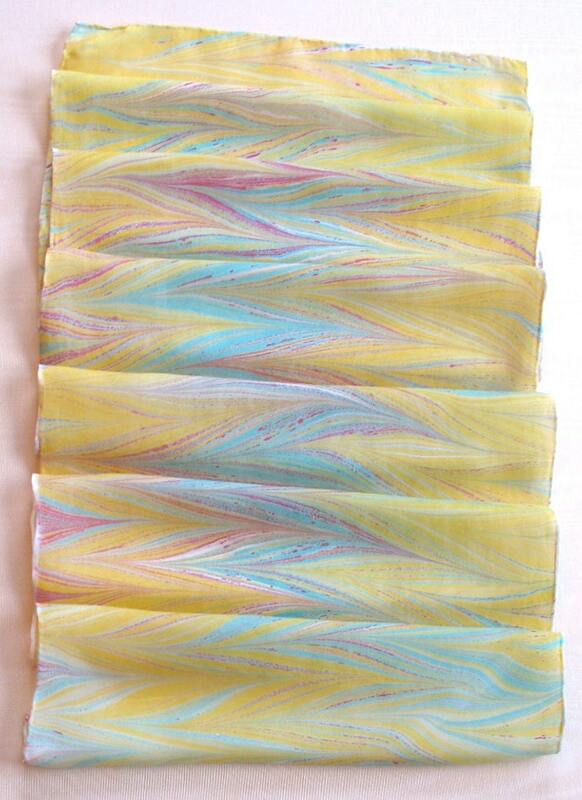 This beautiful scarf is %100 silk and measures 14”X 70"(36cm X 178cm) and is long enough to tie in a variety of ways. The edges are finished with a hand rolled hem. Care of the scarf is easy. Simply hand-wash the scarf in cool water with a mild soap. Rinse in cool water then roll the scarf in a towel to remove excess water. Do not wring or twist. Hang to dry. If ironing is required your can iron the scarf on the silk setting on the non-printed side. If you prefer, the scarf can be Dry Cleaned. There is free shipping for any single mailing of 1 to 3 scarves anywhere in the Continental US. There is a nominal shipping charge for any single mailing of 1 to 3 scarves internationally. See the additional shipping charges below for orders of more that 3 scarves or contact me for more shipping information. All domestic shipping is done USPS Priority Mail. Custom orders are welcomed as well. Feel free to contact me to discuss your desires and time frame or if you have any questions regarding this or any of my scarves. Thank you again for visiting and make sure to check out the other sections of my store for more one-of-a-kind pieces from Brooklyn Marbling.